even the most cynical of law students give in to superstitions, prayers, and the karmic possibilities of good deeds, particularly when the bar examinations draw near. and this resort to the intangible weight of faith becomes ever more evident with all the hoopla and hullabaloo that's involved in the bar operations that are organized by law student organizations, alumni, and even some school administrations to support people who are taking the bar, who in these parts are ironically referred to as barristers. and support comes in all forms, from making transportation arrangements and hotel reservations, to doing menial tasks on the saturdays before the exams, to ensuring that hot meals are available during the lunch break, to churning out tips and reviewers that digest hundred-page decisions and laws into easy-to-read memory aids, and finally to making noise outside la salle in the traditional send off and salubong. 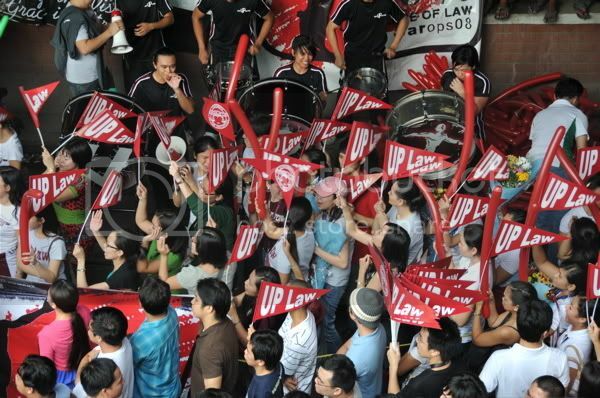 from 1998 till 2001, i was an active participant in the UP law bar operations. although i was never involved in making those "hot tips" on the eve of the exams (which, in all honesty, i never really got to read on the sunday itself, because i chose to just relax and focus on my breathing), whose logistics and preparations involved espionage and prophecy, i dipped my fingers into the more creative aspect of the barops: i made publicity material, and conceived and even designed a few barops shirts. in 1998, i helped in conceptualizing the "a good night's sleep, guaranteed" shirt, which was followed by the mighty barops theme in 1999 (following the success of brad pitt's meet joe black and charlize theron's mighty joe young). in 2000, which was the year of the dragon, i came up with the dragon barops, and asked for my brother's help to draw and execute a really cool design by a barrister where an asian dragon forms the letters U and P (although a few nerds did point out that it wasn't a chinese dragon, but looked more like a wyrm, which is european in origin, and that having the dragon's head at the bottom was bad fung shei -- i told you bar examinees resort to the esoteric!). the following year, i again designed the bar ops shirt, which i patterned after steven spielberg's A.I. i called it R.I. real intelligence. haha. then in 2002 it was my turn to take the bar, and i didn't design the shirt, but i suggested to the barops that they do one after the sanmig plug: SMB, sarap mag barops. a second shirt was released at the time: a beautiful mind (front) comes with a beautiful body (back, with the oblation). but after my stint and contribution to the barops all those years, i somehow disappeared from circulation following the years when i was still practicing law. i've never seen taft since all those many september sundays beginning in 2003. i always had something to do, some mountain to climb, or was just plain lazy. but i somehow found the energy to do it this weekend, the last day of the 2008 bar examinations. i wasn't sure if i knew anyone who would be taking the bar, but i went anyway, hoping to be incognito, and just take pictures for my blog. but i hadn't even fired my first shot when someone came up to me and asked: ikaw ba si quibo? i hadn't heard that since i was in high school, but i was looking at this guy, who looked older than me, trying to place him, but i couldn't. it turns out he was a batch lower than me in trinity, and he very proudly said: tayong dalawa lang yata ang abogado sa tricol eh. i promptly corrected him and said that in my batch alone, there are at least 3 lawyers. although i was already below the vito cruz station of the LRT before 7am, nothing was really happening. it didn't seem alive, and there were a few tents installed, but not along taft. apparently, the SC had come out with a directive describing the bar examinations as a court proceeding, and that it should not be disrupted by unnecessary noise. i wondered whether it would a peaceful -- hence boring -- salubong later in the afternoon. surprisingly, i did see people who were familiar, who all knew my name, but whose names i couldn't remember, and they said i should go back later at 4pm. 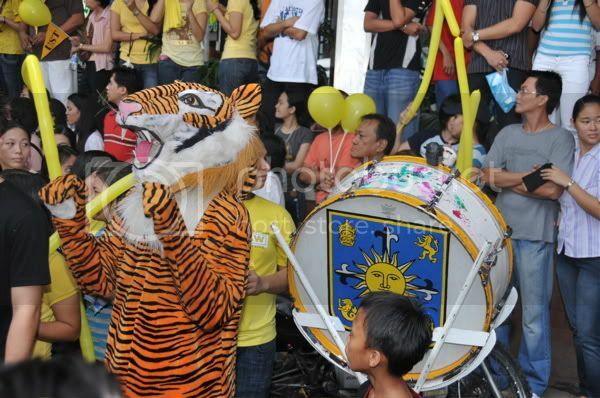 they'd invited the UP pep squad drummers. and so although the scene that morning was so serene it felt almost like a burial, i nevertheless returned to see if the salubong would be as fun as before. when i was answering the last few questions on my legal ethics and legal forms exam back in 2002, i could already hear the beginnings of drum rolls outside -- but i wasn't sure really, it could just have been my heartbeat. my mom and aunt were also there. they'd waited for hours since they sent me off early in the morning. i walked out of la salle, with a big smile of relief and a happiness brought about by a mix of uncertainty and the pure joy of ending a long period of suffering, into a world filled with the sounds and sights of fiesta. beer was thrown up in the air, confetti rained down on taft, marching bands and ati-atihan dancers drowned out each others' rackets, and there was the sincere faces of helpful people congratulating you for enduring 4 grueling sundays. it was the happiest moment of my life that year, along with graduating from law school. this year, the moment i stepped out of the train, i immediately heard the ruckus that was taking place just below the LRT station. the scene along taft looked like a candidate for a stampede, which actually almost happened when someone from the pontifical university popped confetti directly into the electricity wires hanging overhead. it buzzed and zapped and sparkled a few times. but that event notwithstanding, the UP crowd remained calm, stood its ground, and with the help of the pep squad drummers, chanted all these cheers, it felt like a UAAP championship game. 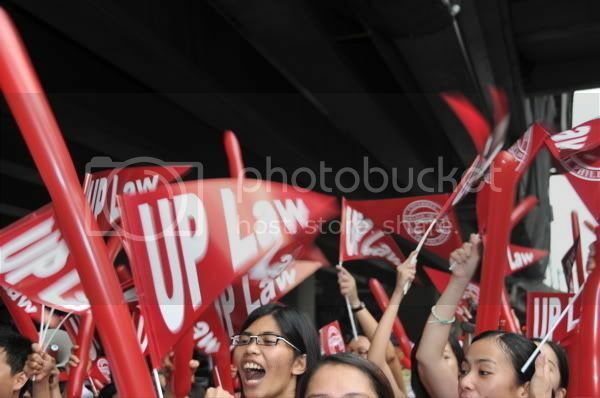 i joined in disturbing the peace, and shouted along with the UP crowd, who were armed with dark red flags and red hotdog balloons (maroon is a misunderstood color). portia sorority and i guess winlaw members were ready with their bouquets, and we outscreamed all the other schools whose idea of congratulating their bar examinees was to douse them with beer and soda. taft was beginning to smell like piss! i overheard an onlooker asking if those who threw beer around were from UP, and i remarked: we're not like that. in UP, if you're not part of a fraternity, you're called a barbarian. 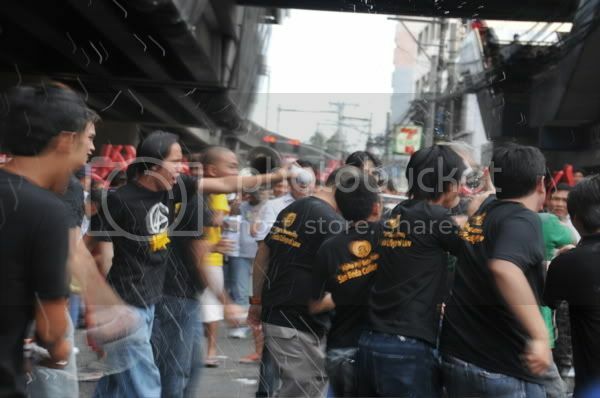 but the frats out there in taft were not just barbaric, but uncouth and immature. haha. incidentally, UST did the same thing to their examinees, but when it comes to the bar, we're not really in competition with them, so i shouldn't pick on them so much. anyway, a few of the bar examinees did come out, and the area welled with tears of joy and sheer, unadulterated school pride. 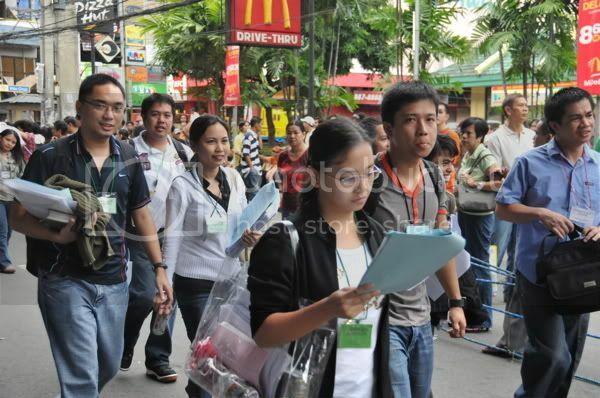 from the very start, you already see the difference: the UP crowd is young, fresh, maybe even sophisticated to some degree. i overheard these guys from an ateneo law frat scoring the UP law girls, who i have say are getting prettier and prettier. and i confirmed this when i agreed to the LSG president's invitation to attend the beer operations -- the celebration following a successful bar operations. i went, looked at the current crop of law students: young, modelesque, rich, found people i knew, gave P1,000 to extend the shot bar for another 2 hours, had not a drop of beer, but had countless shots (at one point the bar tender set fire to my mouth), and had absolutely no idea nor any recollection how i got home. when i woke up, i checked my wallet and my phone and my camera. they were all intact. except for my camera bag. whaaat! i made a few calls, and guess what, it was found and returned! my camera bag was escorted by 3 guys to my contact at the UP law center. law students really do believe that their good deeds will return to them as a blessing (thank you thank you so much!). but we are wont to saying best of luck or break a leg, but when it really comes down to it, you can never tell if someone is going to pass or not because you haven't reviewed on his or her behalf, and you don't really know how well he or she answered the questions, and you just have to ask: how do you feel about the exam? are you confident you'll pass? the mere fact that you went to UP law sometimes gives you a sufficient dose of confidence, but truth is, we've never had a 100% passing average since the late 70s. the highest recently was 97%, and a low of 75 or 76% (my own batch had about 79%). 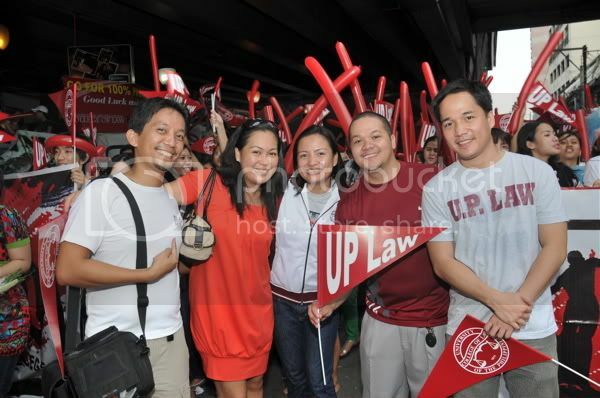 but regardless how they do in the bar, UP law graduates are all destined for something big. so to this batch of future lawyers, i may not know many of you, but we all have to admit that sometimes, the future is so bright, we just have to wear shades.